If I had to describe IU‘s style of music with a season, I would definitely pick spring. The soulful vocals and soft acoustics of IU’s most recent three-song single, Spring at the Age of Twenty, brings fresh vibes into K-pop, a much-welcomed break from the typical style of most artists. While IU’s last album, Last Fantasy, focused on a more intense sound with orchestral features in many of her tracks, Spring at the Age of Twenty is a much more youthful combination of songs that reflect simplicity in IU’s artistic touch. In K-pop, it’s really easy to pick out an IU song. Her voice is like no other female solo singer and her style of music is very consistent. Most of her tracks are light and airy, and even if they take on a tone of intensity, there’s still something about them that just lets you know that IU performed this song. While Spring at the Age of Twenty is lovely to listen to, it doesn’t seem like IU stepped out of her comfort zone at all recording these songs. And right now, it’s not bad for her not to either — she knows her strengths and her weaknesses and what her fans like, so for her to be able to crank out material that she knows will be successful is a great business strategy. I really enjoyed “Peach” because contrary to public opinion, I actually don’t enjoy IU’s orchestral tracks as much as her softer ones. Acoustic tracks showcase her vocals in a different way — orchestral tracks allow her to escalate her voice to unbelievable pitches, but I feel like acoustic tracks are much more down-to-Earth in terms of music. Sure, we all admire her vocal prowess, but somehow I just feel more comfortable listening to her croon to guitar chords and piano melodies. Even though it may have seemed bland and lackluster to some listeners, I didn’t think that “Peach” was designed to be a flashy song at all. 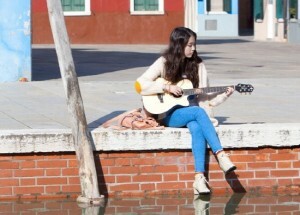 It emphasized its lyrics through a sweet melody and an overall very natural feel. It was also quite impressive that IU herself composed the track and played the triangle for it as well. The second track, “Every End of the Day,” was released in a music video film that lasted over twenty-six minutes (here for those interested). The film showed IU traveling and some behind the scenes footage, as well as a plethora of aegyo-filled moments sure to please even the pickiest of uncle fans. The song itself is a little more orchestral and fast-paced than “Peach,” reminiscent of IU’s Last Fantasy days. She hits some really high notes but still manages to keep an airy feel to the song that resonates throughout Spring at the Age of Twenty. The lyrics of “Every End of the Day” are about longing for the affections of a boy, but in typical IU fashion, the song still sounds upbeat and cheerful. “Every End of the Day” definitely stood out when contrasted with “Peach” and “I Don’t Like Her,” but if it had been included on an album like Last Fantasy, it would have been a filler track. It has a signature IU sound with the orchestral features but at the same time, the song itself isn’t supposed to be as intense as anything like “You & I” or “Good Day.” I do wish the song itself had been a little more original, but it wasn’t unpleasant to listen to. IU could have stepped out of her comfort zone a little more with “Every End of the Day,” but it seems like most people adored the track, and it’s no surprise with IU’s charming lyrics and style. IU ends Spring at the Age of Twenty with another soft, acoustic track. “I Don’t Like Her” is a quieter song that is not quite as energetic as “Every End of the Day” but not as soulful as “Peach.” It was also my least favorite track out of the three, because somehow I feel like the flow of the song wasn’t as smooth as it could have been. I also found it very strange for IU to be singing resentful lyrics paired with such a chill guitar melody in the background. Overall, “I Don’t Like Her” just felt a little off to me musically. Spring at the Age of Twenty makes a nice spring mix of music for anyone interested in relaxing and just enjoying the beautiful weather outside. While this project for IU was nothing as serious as Last Fantasy, I’m glad to see that she’s been experimenting with composing and being more involved in her music, because it promises great things for her next full album. Perhaps she’ll release a summer single to match this one in a few months! As for now, I’m definitely putting Spring at the Age of Twenty on my playlist for final exams studying — I’ll definitely be needing a dose of relaxation and spring while relearning all of my United States history! What did you guys think about IU’s trio of spring songs?